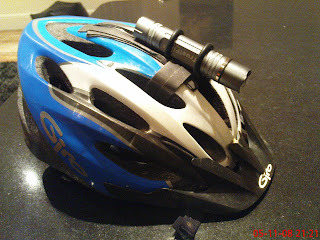 mountain bike adventures and mishaps: The helmet light gets the finishing touches! The helmet light gets the finishing touches! After last nights ride with the new helmet light a few fine adjustments were required to get the correct alignment. This is right up my street as I,m renowned as a bit of a tight wad where buying equipment is concerned so the chance of a home made effort appealed to me greatly. To cushion the light several layers of spongy double sided tape were fixed to the helmet to give as near perfect positioning as possible. Then I made up an O ring with an O ring kit that I had so that the light was held firm. I also made another small O ring to fit to the lens of the light to alter the beam from a spot to a wider spread. Talk about a bodge job!! But it works, so now for Sunday morning to try it all out! a real nifty bit of gear.